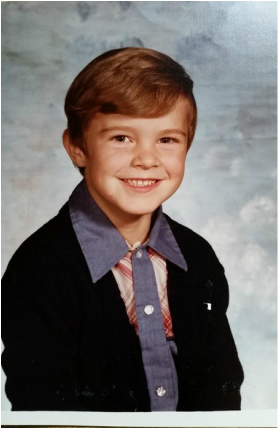 NORTHRIDGE- Have you ever wondered what your teachers looked like when they were in elementary school? Keep reading to see pictures and memories from a few of the teachers here at Northridge. Mr. Wentz: My whole family is made up of teachers, and my mom taught in the same district that I went to. This wasn't a problem until the third grade when I ended up in the same building as her, and the issue of what I would call my mom stared me in the face. Do I call her mom, and then just get made fun of by my friends? It didn't sound right to call your own mother "Mrs. Wentz." She told me on the first day of school that I would need to call her Mrs. Wentz during the school day, which sounded wrong to me. Of course, I couldn't just call her mom, either. It was quite the dilemma. So my solution was to just refuse to talk to her during school hours. I was able to keep that up for an entire year and managed to avoid the issue entirely, which was quite an accomplishment in a school with only five rooms. Mr. Grieger: My most memorable time from Elementary school was the highly competitive all day spring Field Day at Lake Center Elementary School. Kids wore their class colors and made signs. We competed in relay races, frisbee throws, obstacle courses, and other events. An air horn signaled the in change stations, as the entire class sprinted to the next event. Points were tallied by parent volunteers holding clip boards and stop watches. A few kids shed tears while others were named champions and not all received ribbons at the awards ceremony at the end of day. I'll never forget: 3rd Grade Field Day Champs Mrs. Cunningham's Class! Mrs. Garee: One of my most memorable elementary school moments was a little tragic, actually. It was Valentine’s Day, and I was in second grade, and I had worked for about a week designing and decorating my Valentine’s box for the class party. I couldn’t even sleep at night, I was so excited. When I finally got it done, I thought it was the most beautiful Valentine’s box ever. The morning of my class party, I was so proud to show it off, but I started to feel kind of bad. My eyes were burning, and I hurt all over, and then I started shivering. My teacher saw me come in and, instead of applauding my box with all its cool decorations, she touched my head and sent me to the office to call home because I was burning up with a fever. I went to the office, where I insisted that I did not want to go home. I wanted to go to the party. Then I threw up … right in my Valentine’s box and right in front of everyone in the office. They took the box away from me, so that was that. The next week they gave me some paper Valentines in a sandwich bag.